Hi everyone! Hope you are all doing good! I too spent a relaxing week as it was not hectic in the early morning. Since my kid had half a day week, didn’t need to pack lunch for him. Soon Spring break is coming, so another reason to smile. Today I'm going to share simple yet delicious recipe of chicken. Methi Chicken/ Methi Murgh is one of the most popular dishes from Hyderabad cuisine. When I plan to cook something easy but wholesome non-vegetarian meal for my family, first comes to my mind either this one or Palak chicken. As my husband always likes healthy diet, he needs a complete meal where fiber, protein and carb, all three are there. Though we are non-vegetarian but equally love vegetables. So when we get the both in one dish, it becomes perfect combination. Fresh fenugreek leaves or Methi is very common herb in Indian cooking. 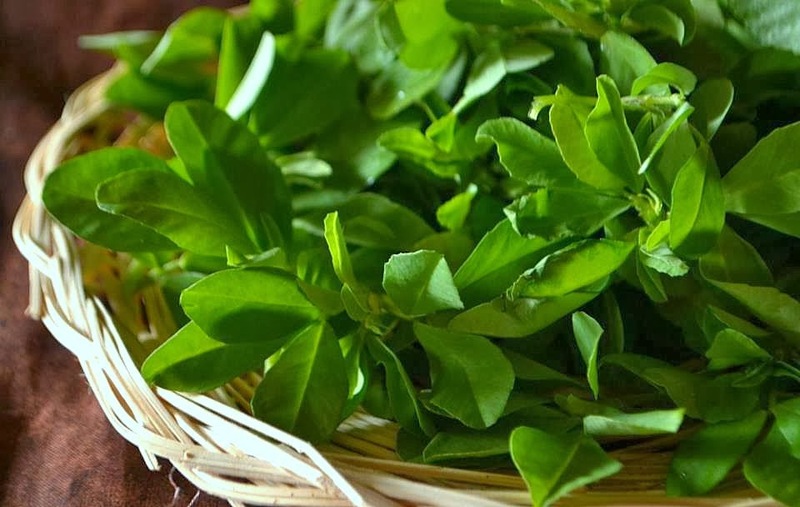 This herb has many health benefits and rich in Protein, Vitamins and Minerals. 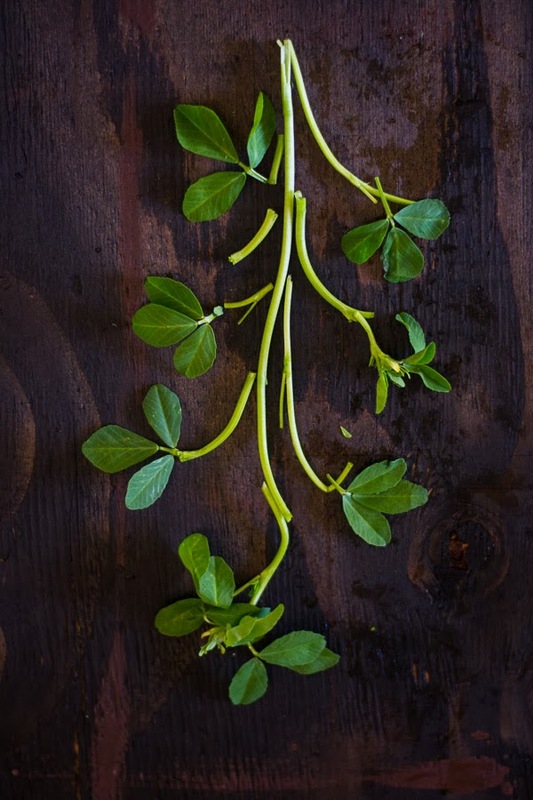 So many delicious dishes are made of these leaves, few from my favorites are Methi-Begun and Methi Malai Matar. 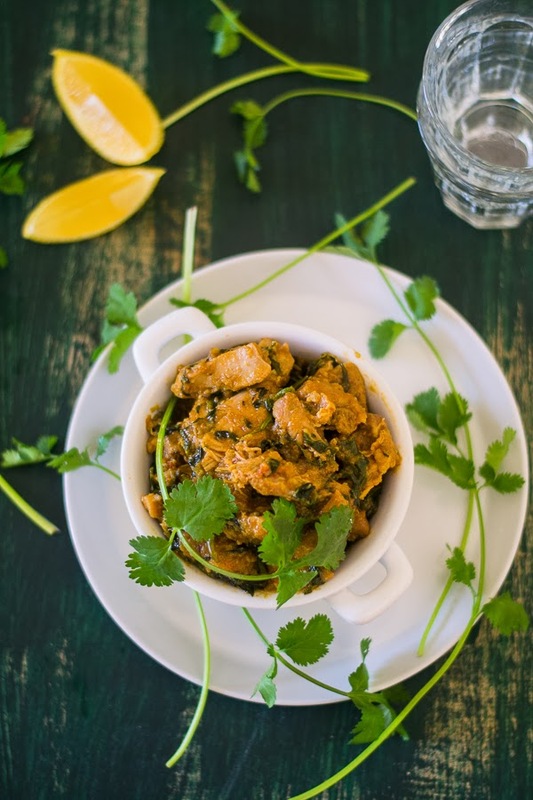 Though the Methi leaves is slightly bitter in taste, but here chicken and Methi compliment each other. 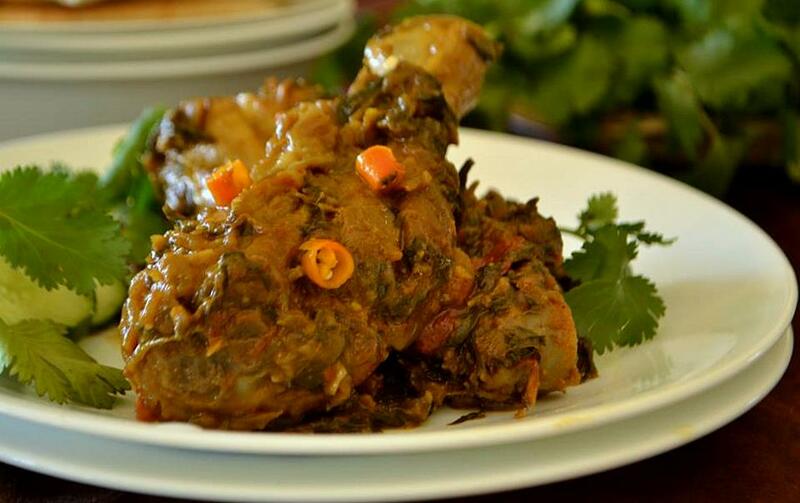 The name itself describes that the chicken pieces are cooked in Methi leaves gravy. 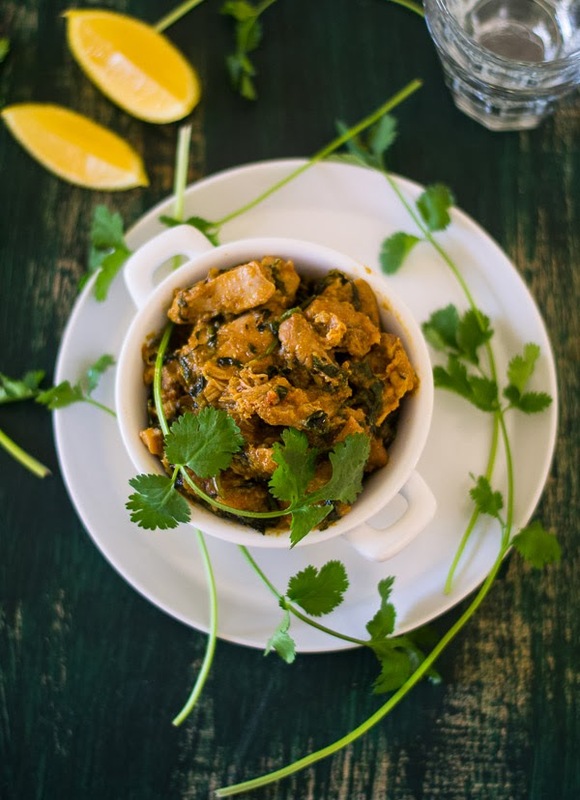 The fresh leaves of Methi provides a lovely flavor to this dish. For this recipe, I followed Vahchef Sanjay Thumma, though changed it according to my taste. Generally it is served with rice and with a bowl of raita, but to me it is equally good with Indian Flat Bread. Please note that you need little thicker gravy to have it with bread. 1. Heat oil in a big non-stick pan and add the whole cumin seeds. Once it splatters, add the onion and add little salt which helps the onion to become soft quickly. 2. Cook them till it gets nice brown color and add the ginger- garlic paste. Cook again for 5 minutes till the raw smell goes off. 3. Add turmeric powder, coriander powder, chili powder, green chilies and stir them until they are nicely cooked. 4. Add tomato pieces and cook them for 2-3 minutes again. Then add whisked yogurt with 2 tbsp of water. Mix them nicely and cover it with a lid for 5 minutes. Let it cook in medium flame. Once it gets a nice color and tomato is completely cooked, add in the chopped methi leaves, which would have been washed nicely. 5. Mix it properly and add the chicken. Again stir for 2-3 minutes. Once you add chicken, water will be released automatically. Then cover it and let the chicken cook at medium flame. 6. Once nice aroma starts coming, chicken is 70% cooked and the gravy will start thickening. Open the lid, stir it nicely, add the chopped cilantro and salt. 7. Stir it until the chicken becomes tender and soft. Check seasoning and the consistency. Add the garam masala powder. Mix it nicely and turn off the gas. Methi Chicken is ready!! Serve hot with steamed rice or flat Indian bread. Note: You can follow the same recipe with the lamb. But you should pressure-cook lamb separately then add it in the place of chicken. One more thing to be noted that when you add yogurt, make sure it is in room-temperature and slower flame at the same time. This will help you to prevent the yogurt from curdling.